General editors' preface; Acknowledgements; General introduction; Translators' remarks; Reflections on the Philosophy of Right; Natural Right course lecture notes by Feyerabend; Drafts for published works; Drafts for Theory and Practice; Drafts for Toward Perpetual Peace; Drafts for the Metaphysics of Morals; Drafts for Conflict of the Faculties; Notes; Glossary; Topical and chronological concordance; Index. Frederick Rauscher is Professor of Philosophy at Michigan State University. He is the author of Naturalism and Realism in Kant's Ethics (forthcoming), co-translator with Curtis Bowman and Paul Guyer of Kant's Notes and Fragments, edited by Paul Guyer (2005), and editor with Daniel Omar Perez of Kant in Brazil (2012). Kenneth R. Westphal is Professor of Philosophy at Bodazici UEniversitesi, Istanbul. 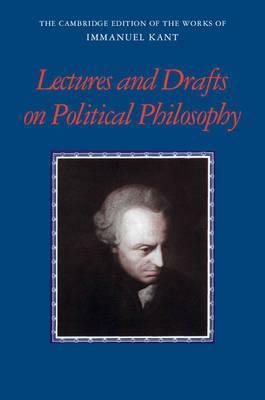 He has published widely on German philosophy, and on Kant's philosophy in particular. His publications include Kant's Transcendental Proof of Realism (2004) and How Hume and Kant Reconstruct Natural Law (2016).